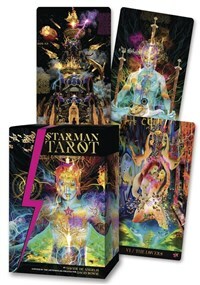 The most eagerly anticipated tarot kit of the year! In 1995, David Bowie and Davide De Angelis began collaborating on album art for Bowie's album Outside, a creative working relationship that endured for more than seven years and spanned a number of projects, including the development of art for the album Earthling and concepts for stage sets, books, products, and art shows. Inspired by their years-long creative collaboration, Davide De Angelis has produced a fascinating tarot deck, decades in the making, that expertly weaves together intricate sacred geometries, alchemy, magic, and the sacred teachings of the world's mystery traditions. This deck is a must-have for collectors and a perfect reading deck designed to help you connect with spirit or energize a creative project. Boxed kit (5¼ x 8) includes a 78-card deck (3 x 5½) and a 192-page color guidebook. Davide De Angelis was born in London, England, and is an award-winning designer and visionary artist. He worked directly with David Bowie and his company Isolar for more than seven years, designing album art for Outside and Earthling, and helping to conceptualize and create stage sets, books, and art shows. Davide is also a writer, philosopher, and creativity facilitator. His work is renowned for its experimental and beautiful ways of using language and images to powerfully communicate ideas and open people to astonishing possibilities. He strongly believes that art has the power to revolutionize how we engage with the realm of business, ideas, and ultimately how we engage with life to express our fullest potential. Inspired by life’s adventure and a passion for learning, Davide spent over a decade training with shamans and energy masters from both East and West, and he regularly leads workshops on personal transformation.